This entry was posted on Tuesday, July 28th, 2015 by Frances Ryan. I’ve talked a few times about my desire to build healthy routines for myself, to get out and be more active, and, of course, to prioritise myself a bit lot more. And I’m pleased to say that I’ve been working on all of those things over the past few weeks. In fact, I’ve been making all sorts of plans to ensure I keep filling up my diary! And now that summer is upon us, I’ve been giving a lot of thought to my summer holidays. After all, most people I know are taking trips somewhere—and most are asking me about my summer plans. Only as I spend the absolute vast majority of my time alone in the first instance, I’m not really in the mood to take a week’s holiday alone. I mean, I don’t hate my own company, but a holiday should be something different. And alone wouldn’t be different. Plus that, I am a starving student, so I couldn’t afford a lovely holiday away, even if I wanted one. But at the same time, I don’t want to spend the whole summer sitting around doing nothing. And so I’ve been making plans and filling up my diary. Some of my plans are solo adventures to Jazz gigs and shows at the Edinburgh Fringe Festival. Some of my plans are solo adventures to local sites of interest. Some of my plans are solo day trips around Scotland. Some of my plans are solo picnics at the top of Arthur’s Seat or at one of Edinburgh’s many public gardens. And, importantly, some of my plans are day trips or visits to museums or historic sites with friends. And by the end of summer, I hope to have crossed off all of the 14 places BuzzFeed tells me are nearby—along with a couple of my own lists. And almost everything I do and see will be free or cheap. Because I like a good bargain, you know! Oh! Oh! And I’m planning a wee trip to England where I hope to do some hiking and beer-drinking with one of my brothers-in-law. I haven’t booked my train tickets yet, but I plan to do that as soon as I can decide how many days I’m going for. There’s no real point to this post other than to let you know that there will be some fun (and picture filled!) posts to follow. And the picture with this story? 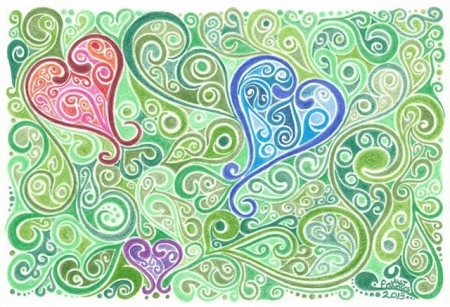 Well, that’s just a random swirl drawing that I did for my lovely friend Suzie.